Yes, it is finally done. The Pothos Shawl for my SIL is finally done. I am very much in love with the result. The pattern by Anne Hanson is well written and clear. 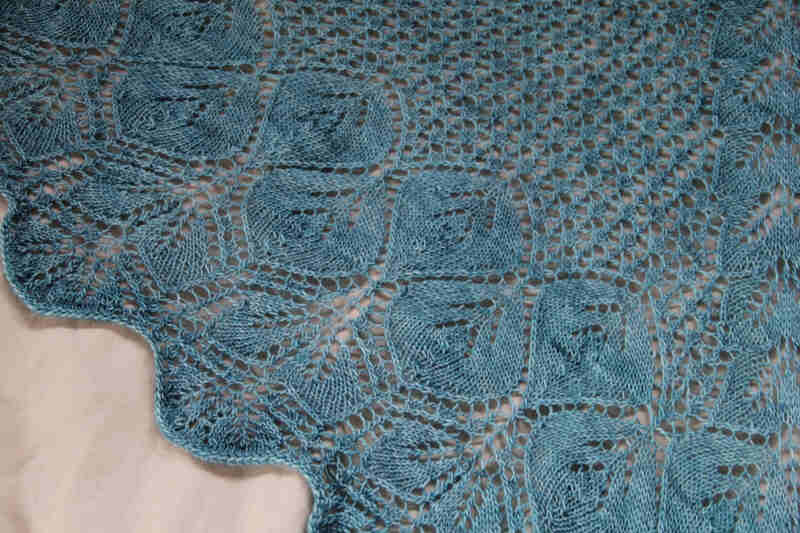 All the trouble I had with this shawl stemmed from me alone and not from the pattern. It turned out to be a big beautiful piece of knitting. Pothos is the name of an Asian plant with leaves the shape of which are in the shawl. As I said in my last post, the gods of knitting don’t like smugness nor do they like giddiness. Remember I was “giddy” that I only had 3 rows left and the bind off. I should never have even hinted I was anywhere near the feeling of happiness. The knitting gods got me and got me good. The Skipper was out-of-town overnight on what I thought would be the final night of shawl knitting. All that was left was the bind off. I was breathless with happiness. It is a big shawl and the bind off was going to take most of the night. Before I sat down to begin, Yarn Rascal and I went for a rummage through the yarn vault where he selected a small ball of left over yarn as his companion for the evening. Yarn Rascal with his ball of yarn and I with the shawl sat down on the living room couch for an evening of bliss. I had 10 bound off stitches of the 500 plus when it happened. The lights went out. We were pitched into complete darkness, which frightens Yarn Rascal. He jumped into my arms already filled with the shawl and began doing his nervous dance. All I could think of is this is the revenge of the knitting gods. I should have never said I was giddy. There was no reason to lose electricity no storm nor wind outside. It was calm and the moon was nearing full. It all came down to that one word: giddy. 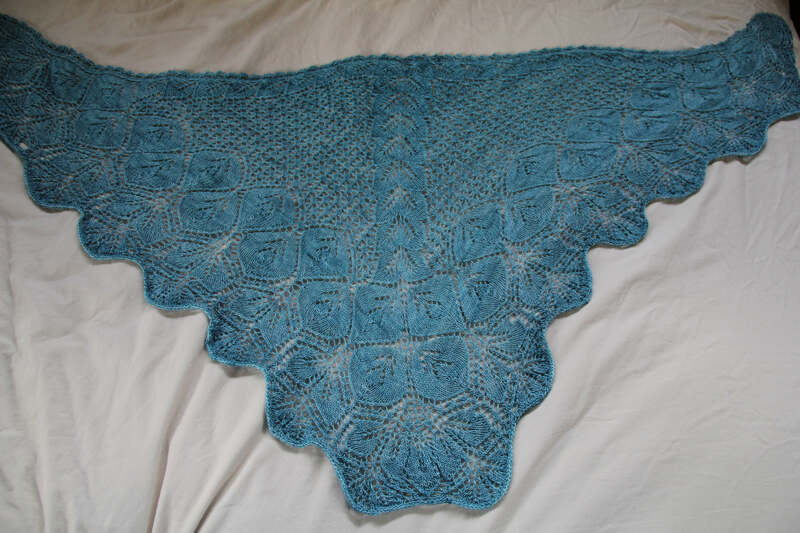 It was clear to me that this shawl was going to vex me until it was packed up and sent out of here to it’s new owner. I untangled Yarn Rascal from the shawl and held him while I stumbled around searching for my cell phone which has a flashlight feature. A few banged shins and a lot of curse words later I put my hands on it and turned it on. Yarn Rascal went wild. He is not a calm little dog in a power outage. I thought of setting up candles to provide him some light, but I don’t like to leave burning candles unattended and I would need to do that in order to set up the generator, which I have only set up once before. I opened the drapes instead and let the moonlight in. This did not soothe him. I had to battle him to get to and through the door into the garage and generator. How long can a dog bark, yelp, and throw himself against a closed door? Well it seems Yarn Rascal is a marathon barker, yelper and jumper. The dog has endurance. He kept it up the whole while I tried to set up the generator. Setting up the generator by moving it outside the garage door is a 5 minute job for the person who knows what he’s doing. Key word here is “know”. The first thing I realized is that the garage is absolutely black darkness when there are no lights. The second thing I realized is that the flashlight on the phone doesn’t make much of a dent into that darkness. And the third thing I came to understand is I need light to walk down a group of stairs properly. Waving the flashlight around looking for the generator and not concentrating on the number of steps I had to descend got me to the bottom of the stairs more quickly than I expected. The garage is a two car variety. The garage door is large. It also runs on electricity but can, hypothetically, be opened manually. How hard can that be? I positioned myself and bent over to lift the garage door. It came up maybe three inches before it snagged, at which point I could hold it no longer, and it slammed shut the way a guillotine whooshes down just missing my feet. No problem, I thought. Just assume ballet position number two, making sure the feet are out of the way and try again. Same thing happened. Something was preventing the garage door from going up. I take up the flashlight and run it over the mechanism of the door. Sure enough the door has a “safety” feature on it which is a lock that prevents people from just lifting the door up and gaining entrance. The little handle for unlocking the lock was dangling over my head and out of reach. I tried jumping up to grab it and pull it down, but unlike Yarn Rascal, who was still going strong, I finally had no jump left in me after a handful of tries. Looking around I noticed there were no ladders in the garage. They were all up in the barn. I had a decision to make: I could walk all the way up to the barn with no lights and hope that I wouldn’t meet a coyote or a mountain lion or I could find something in the garage to stand on and then jump from that and grab the release handle. Briefly I eyed the tractor. If I stood on the seat I was at the perfect height to grab the handle. But the tractor was back in the corner and not positioned where I needed it. Also I had at least two hours worth of things to move out of the way to get the tractor in position. Lastly there were no keys in the tractor and I had no idea where they were. The next thing I came up with was a milk crate. While not tall enough for me to reach the handle even on tippy toes it did give me a higher platform to jump from and attempt to grab the handle. My thinking and attention was totally centered on grabbing the handle to release the lock and I never once thought about where I would land once I launched myself into the air. This was an important oversight. I placed the milk crate under the handle stood on top of it and jumped like I was going for a gold medal. My hand touched then grabbed the handle and I heard the lock click open. I experienced a very brief feeling of success that ended in some pain when I landed amid the clutter on the garage floor. I remember being surprised that the chain saw was on the floor, but it was a fleeting surprise as I crashed into saw horses, two by four pieces of wood, a full gallon can of gasoline and a wooden bench I never saw but would have worked better than the milk crate. I got up, dusted myself, off ignored the bleeding and went to open the darn garage door. This time I got the door open a good 10 inches (25) cm before it whooshed back down trying to sever my toes from my feet. I tried it three more times, but the problem was my left arm, the mastectomy side. While my right arm was strong enough to lift and then push up, my left arm couldn’t do the push motion. Down the door crashed. I thought for a bit. If I could wedge something underneath the garage door to hold it at the 10 inches (25) cm, I could then reposition myself to lift it a little more and wedge a taller item under it and if I could get it up high enough doing it this way I would be able to push it all the way open. But what was I going to use as wedges? After much searching and a bad encounter with a rake (never leave the tines outward where they are easily stepped on in the dark), I found an entire set of the Encyclopedia Britannica high up on a shelf in the far back of the garage. The Skipper is probably the last person on earth with a complete set. But they would work well, I thought, as wedges. I was planning how I was going to climb up to the shelf and get the books when I noticed that Yarn Rascal was silent. I called his name. Nothing. Was the dog dead? Was he eating the shawl? Did he have a nervous breakdown? I picked my way back around the garage, avoiding the rake, to the stairs. When I opened the door there was Yarn Rascal sitting panting in the middle of the shawl, his ball of yarn by his side and the lights were on. We had lights again! After the SIL shawl sat in a time-out for a little over a week, I am once again knitting on it. I have 20 rows until it’s done. Why this is being the mother of all shawls is beyond me. It’s not the pattern, it’s me. Somehow I can’t count to 24. I also keep blowing the double central decreases. Why I don’t know. 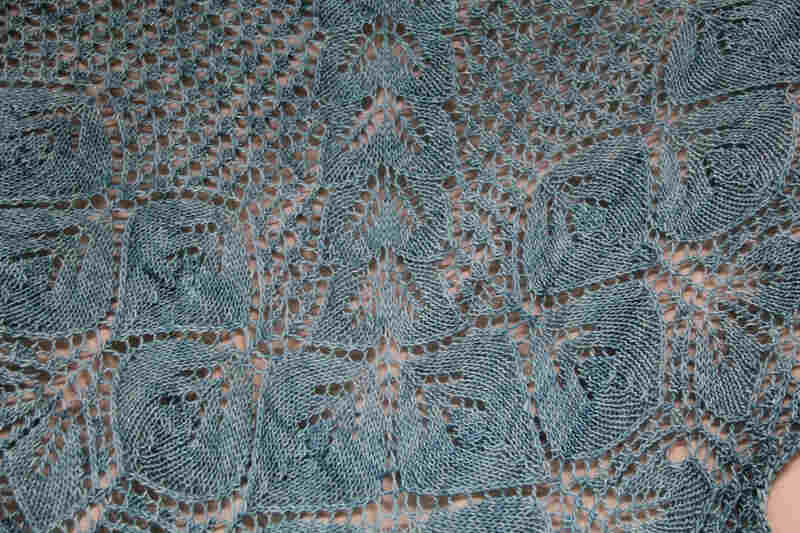 The knitting is not hard to read, I just can’t seem to shake the sense of doom I get each time I pick up this shawl. The Skipper seems to think I have other things on my mind. I went to my oncologist last week and found out that my bone marrow is not making platelets so I have a low volume of platelets. It’s called thrombocytopenia. Why the marrow is not making platelets may be a combo of the radiation treatments and the cancer med I am on. Or it could be that my spleen is destroying them. While they can’t take me off the cancer med, they did pull me off the nsaid they had me on for the pain in my bones. It’s a shame because the nsaid was working pretty well. At the moment, they won’t even let me take a simple aspirin or Tylenol. Still I knit and sketch new designs and dither over the designs I have completed. I used to like to have a span of time between completing a design and writing it up in good pattern form. It gave me some distance on the design so that when I returned to it again it was with fresh eyes. But these latest designs are sitting and sitting. Every time I think of picking up my notes and writing them up in pattern form something crops up and I have to put it off. This weekend I am locking myself in my work room and getting at least one of the patterns typed up. I also need to take some pictures for the tutorial that will be included in the patter regarding ribbon work on the bonnet. The ribbon work is simple enough, but not many people today know how to hand-sew things neatly. Once hand-sewing skills were the norm, now they are not. I have a friend who tosses a shirt if it looses a button. She owns no needle and thread and wouldn’t know where to start to even try and attach it. How things have changed. Yarn Rascal still has his eyes on the prized Shetland wool package that is hanging from the closet ceiling out of his reach. I may not be able to hold him at bay much longer. When he breaks into the yarn vault he now stands on his hind legs and howls at the package. Usually this is around the 2 am time of night. I almost broke the package open and gave him a cake of wool last night as he just wouldn’t settle down. But if I do that now, he will just want another one when I start working with it and I only bought one extra for him. I didn’t think it would take me this long to get the Shetland Shawl up and running. All things in the yard are normal. The buck now has a little harem of does with him. Hank still visits the pond. I haven’t seen the coyote or the mountain lion, but if the deer and the Great Blue Heron are around it’s a pretty good sign that the coyote and the mountain lion aren’t in the area. Oh yes, and the skunks haven’t gone into hibernation yet. Don’t even ask how I know this.